For us, there is nothing more magical and relaxing than watching the rivers and canals of St Petersburg or the Gulf of Finland in the summer while sitting in a cozy restaurant. Riverside Restaurants in St Petersburg, Russia. If you would like to take your Russian dining experience to a new whole level during your stay in St Petersburg, then you cannot miss one of our riverside restaurants. You'll enjoy not only a mix of delicious European and Russian dishes crafted by international chefs, but also amazing views of the Neva River and its canals, which are surrounded by historic landmarks of the 19th century, and much, much more. To help you to choose, below we have put together a list of some riverside restaurants in St Petersburg, Russia that we have visited and like. Tip: Many of these riverside restaurants in St Petersburg listed below are very popular among locals and visitors, so if you want some peace and quiet as well as the best seat, then make sure to book a table in advance. Luxurious fine dining, Summer nights, Relaxing atmosphere! If you want to enjoy a romantic dinner on the terrace, to feel the river breeze in the summer and enclosed warmth in the winter, while sampling excellent seafood, then you have to go to Na Rechke, one of Russia’s top riverside restaurants in Saint Petersburg. Overlooking the Krestovka River, Chef Nikolay Matveyev will delight you with a mix of Haute cuisines from Japan, Italy, Russia and Caucasian Republics. Popular with upper-class Russian and working professionals, this is a great spot for a high-stakes business meeting or a romantic dinner. Cruise ship, Family-friendly, Seafood galore! Regatta is exactly as its name suggests - a cruise ship that is docked by the Krestovsky Island - true to St Petersburg’s moniker as the Venice of the North. Each season, its gastronomic mastermind Chef Dmitry Orlov creates new menus based on classic European, Mediterranean and Russian dishes. Not forgetting its nautical roots, the autumn Mediterranean-focused menu is infused with delectable seafood, like the octopus risotto with sundried tomatoes and the spaghetti with belomorskie mussels. With a nice panoramic view of the city, a big summer terrace and a friendly atmosphere, the Italian restaurant Regatta is ideal for family outings, especially in the summer. 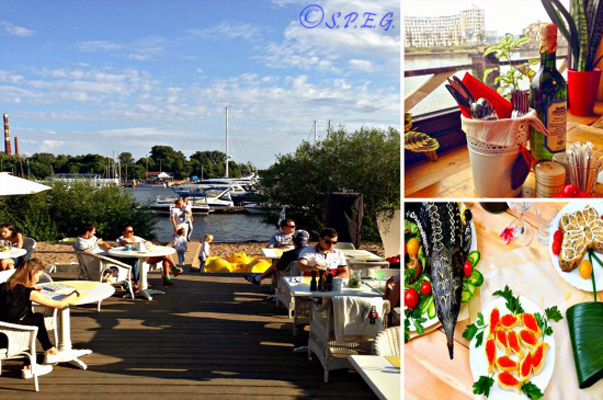 Location: Krestovskiy Island, at the "Rowing Club Znamya"
Moving Restaurant, Fresh seafood, Social dancing! Volga-Volga – unlike Regatta – is not docked, but a working riverboat, which cruises up and down the breathtaking Neva River between May and October. Expect to get a tour of the famed tributary of Russia’s Northern Capital whilst sampling the finest Russian cuisine by Chef Alexander Belkovich. With ingredients delivered twice weekly, you are able to sample fresh and authentic Tom Yum and large grilled seafood and fish platters with scallops, shrimps, crab, white fish, squid, mussels and spiny lobster on the deck as you enjoy views of the city's drawn bridges and watch socialites on the dance floor. Fine Italian cuisine, Great river views, Imperial dining! Il Lago dei Cigni (Swan Lake) is a new Italian restaurant founded by famous gourmet chef Remo Mazzucato in the Venice of the North. You will be buoyed by its luxurious interiors, classy wine list and Mediterranean hospitality, as you overlook the Neva River and watch the sun set over the Gulf of Finland. You can relish carpaccio made from the tentacles of giant squid, watch as Japanese marbled beef is prepared on volcanic rocks of pink salt or choose from a selection of homemade pasta with white or black truffles served in a wheel of 24-year-old Parmesan cheese. Your dining experience here will be truly imperial in every sense! Great views, Nice ambience, Smelt offerings! Located in the famous Peter and Paul fortress, a new riverside restaurant called Koriushka or ‘Smelt’ – named after the famous St Petersburg fish – is another trendy release by Ginza Project. Emphasing space and a light and airy aura, Koriushka can seat 340 people in three halls and a terrace. Run by Chefs Ivo Dzandzava and Alexander Belkovich, here you will taste a mix of European and Caucasian-style dishes with strong St. Petersburg dining influences. Among the dishes on offer is the signature smelt in several styles: fried with tkemali sauce, fried in nut au-gratin and home-style smoked - plus much, much more. Celeb spotting, East Europe dining, Wide-range! Whether you are coming to watch the football on Petrograd Side or taking a break from the historic heart of St Petersburg Russia, Yunost, meaning ‘youth’, is a comfortable and trendy Russian restaurant floating on a lake near the Petrovsky Stadium. As a result of its location, Yunost is a frequent haunt of football stars. Created by the football club Zenith, Chef Sergey Pronin’s serves creations that range from salads and Italian starters to shashliks and tasty wok dishes. The menu includes the best of European, Uzbek and pan-Asian cooking. Enjoy your meal as you watch fish leap out of the lake in the waning evening light. Definitely one of the most interesting riverside restaurants in the city! Light and rustic feel, Cheap child shows, Quality entertainment! SunDay Ginza’s cozy interior, tasty European and Japanese cuisine and excellent service help make this one of the hottest riverside restaurants in the city of St Petersburg, especially among newer additions. From the covered terrace offering a very close view of the Gulf of Finland and the restaurant's light and rustic interiors to the menu's good mix of gastronomic dishes and music performances by the coolest DJ's, at SunDay's you will not only enjoy the food, but also the pleasant young atmosphere and location. Value for money, Traditional meat dishes, Cultural events! Located on the heart of the Neva River, right in front of the Spit of Vassilievsky Island, Do Zari is a restaurant on the water offering one of the most spectacular views of the Neva River, especially during the famous White Nights. Surrounded by historic landmarks from the 19th century, the restaurant serves traditional fare, such as roast beef, tenderloin and salmon dishes. Here the unique and casual atmosphere, first-class service and superb location will make your dining experience a truly classic Russian one. Creative dishes, Great wines, Close to historical landmarks! Another in the long line of iconic riverside restaurants in Russia, Volna or ‘Wave’ stands out for fresh produce, flown in from across the world, and creative specials. It supports regional farmers, whipping up specials with available local fruits, salads, homemade jam and free-range chickens. This Saint Petersburg dining establishment draws upper class locals who want to enjoy the outside air in wicker chairs or have discreet conversations inside while drinking by wine from New Zealand, South Africa, Argentina, Spain and Tuscany. If you are touring around Peter the Great's House, the Aurora ship and Peter and Paul Fortress, don't miss this restaurant! Ice fishing, Classic Scandinavian decor, Russian political elites! One of the most awarded riverside restaurants in St Petersburg, Russkaya Rybalka’s Scandinavian interior has classic wooden panelling inside, while outside you can try your hand ice fishing and catch your own meal. Enjoy breathtaking views of ponds and waterfalls as you savour different types of caviar: sturgeon, pink salmon, hausen, red salmon, Siberian salmon and sea urchin. You will be spoilt for choice with main courses like whitefish baked with vegetables, trout fillet on fennel stew and flounder baked tomatoes with mussels. The restaurant's classic Russian cuisine has attracted Presidents Vladimir Putin and Jacques Chirac, and it is now frequented by political elites.